Kira, can you share your background with us before you found yoga? Wow, I don’t think I can say I found yoga, I believe it definitely found me. I worked at a Big5 accounting firm as a junior associate, doing compensation surveys, management audits and job evaluations. This was after getting an Honours Degree in Zoology and Organic Chemistry. At university, I was a naturally gifted academic, I guess, but I can’t say I was motivated by my courses. You could safely say that I had no idea WHAT I was doing, or wanted to do. (giggles) I was doing things I had the skills and natural aptitude for, but I didn’t have the passion for them, and, at that time, I had no idea that I didn’t, or how important the idea of having passion even was. About sixteen years ago, I made a significant shift in my life where health was concerned. I stopped smoking cigarettes, changed my diet and started working out in the gym. I had always been a thin person and at that time, I was bordering on the unhealthy and I needed to change that. I found that my body was responding pretty quickly to weight training and cardio, I was developing a nicer-looking body and that was so exciting! However, I still struggled mentally, I had never been a very relaxed or easy going person and insomnia became a daily feature in my life, I’d be wide awake at 3 AM when I needed to be up to get ready for work at 6. Definitely not sustainable, right? So anyway, I found out that there was going to be a yoga class taught one evening each week at the gym, perfectly timed for right after I finished my training. I’d seen yoga books set in the 1970s with people in unitards performing contortions I couldn’t even begin to imagine myself doing. Working out had made me slightly stronger, yes, but I was stiff as a board, except for maybe my hamstrings, so I thought “I’ll take this class to help me stretch”. I remember meeting the teacher, a tiny, powerful pixie of a lady named Susan and thinking “OK, here we go!” 45 minutes later, I was thinking “what have I gotten myself into?”. I was so spent mentally that I fell asleep during Final Relaxation (Sukhasana) and someone had to wake me up. THAT woke me up to the potential of yoga. But I was still a far way away from whom you know today. 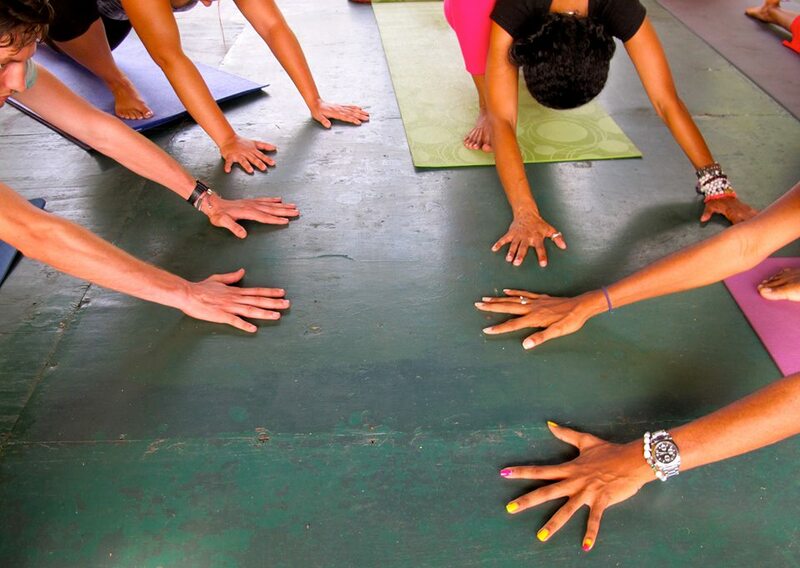 How did you begin integrating yoga? And how did this path lead to Ashtanga? So, after that very first class, I was sure that I needed to know more about this yoga “thing”. That first teacher told me about a new studio that was starting near to where I lived, so I decided to go and check it out, I went one Sunday morning (when most Jamaicans are headed to church) and joined a group in this tiny room. The teacher that day was Sharon, who also owned the studio, and I absolutely loved how hard her class was, I had NO natural flexibility, sitting in Baddha Konasana, my knees pointed WAY high up to the ceiling whilst everyone else was super-limber, knees dropping to the floor. I didn’t care though, I was just so fascinated with the way that I felt! And from then I was hooked, I took every kind of class I could, I purchased every DVD from Shiva Rea to Rodney Yee, I got a thin sticky mat and just dove straight in, not necessarily knowing or caring about the path I was taking, I just knew that it felt good, and I could sleep! I lived in Europe briefly between 2003 and 2004, working as a volunteer in a charity organisation in Poitiers, France and I was on the slimmest budget you could imagine, BUT I could buy a book on yoga and I learned how to do Sun Salutations and basic breathing exercises. It was great. When I returned to Jamaica, I started working out in the gym again, but this time it was different. I was different. There seemed to be this competitive edge there, always someone impatiently waiting for the machine you were using and huffing when you didn’t vacate it fast enough or some person coming late to cardio or step class and still insisting on squeezing into the front of the class. That doesn’t sound so calming, does it? It wasn’t. So I was getting “strong” but continually tightening my body and the yoga was just there to reverse the effects of the gym, and then I’d wake up to do it all over again the next day. Soon, it became pretty clear to me that that wasn’t a working formula, because I was coming up with a net sum of zero. I wanted more so about two years later, in 2006, I chose to give up the gym completely and focus on yoga as my only physical discipline. I honestly wasn’t worried about how I looked, well...I was, but I was more focused on staying strong and getting more flexible. I was definitely more drawn to the more physically challenging forms of Hatha yoga like Vinyasa Flow, Power Vinyasa, Iyengar and Anusara, but I still felt something was missing, I was only then beginning to scratch the surface of the deeper mental and ‘spiritual’ aspects of the practice of yoga. I knew a little about the yoga sutras, but had no ideas of the eight limbs or the subtler aspects of the practice. Ashtanga now, that’s a sweeter tale...even now when I tell it, I feel emotional. I was doing research online about going to a yoga conference and I practically stumbled onto the woman who would later become my root teacher, Kino Macgregor. I looked her up on YouTube and was stunned by her accomplishments, and far more deeply, her devotion to this method of Ashtanga Vinyasa. I read further and discovered that the method was taught in a precise way and that the practice was a set sequence of postures and I loved that, because it meant that I could memorise the postures and allow my mind to relax a bit, and maybe let go a bit. So I was excited. Back home I had done a 40-hour Iyengar Immersion and had started teaching a class here and there, nothing serious, but I loved it, I’d stumbled onto something I still couldn't rightly name, but I was passionate, for the first time, and I was clear that I needed to share what I was feeling. Researching further into Ashtanga online, I found out that Sri K Pattabhi Jois would be making what we know now to be his last trip to the United States to teach at the Jois shala in Islamorada, Florida, and I said “listen, he’s over 90, he’s been ill, this is a once-in-a-lifetime opportunity, go and see, go and listen, just go”. It was the Memorial Day weekend of 2008, and a sweet girlfriend of mine agreed to drive me down from Fort Lauderdale (I flew up from KIngston for the long weekend, also a holiday in Jamaica) down to the Keys, she sat dutifully in her car and read while I joined a multitude of faces pouring into this large space that reminded me of a gymnasium, but that had large photos of Guruji, Saraswati and Sharath everywhere. I can remember it like it was yesterday, all the noise of 200+ people talking, arranging themselves, putting down mats, I was seeing faces like Tim Miller, whom I’d only ever seen in photos and Kino, to whom I nervously drummed up courage to introduce myself. So much sound, and then suddenly the noise seemed to die away, like a wave of silent reverence blanketing this giant room. I had had my back to the door, but the increasing quiet caused me to turn around. What I saw was a frail-looking man dressed in white being wheeled up a ramp into the room, but I couldn’t miss the impact he had on those gathered there. He raised his voice “Samasthitih” and we all stood facing him, and then “om, vande gurunam…” and somewhere between then and “pranamami patanjalim”, I was simply sure, sure I’d found what I was looking for, sure I was in the right place, sure that this was path for me. Almost seven years later, I know I was right. You had the good fortune of practicing with Guruji before his passing. The experience left an indelible impression on you. As an authorized teacher, what does parampara mean to you? Wow, that question made me think long and hard. When I think about it intellectually, ‘parampara’ means ‘a direct transmission of learning from teacher to student’ and for a very long time, as a newbie Ashtangini, I didn’t get past that. 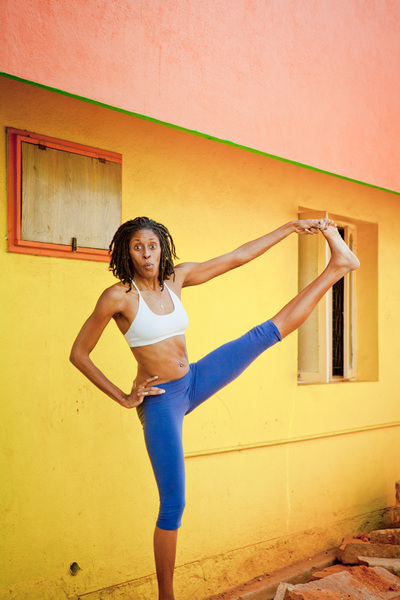 Here in Jamaica, I practised alone, there wasn’t anyone teaching Ashtanga, and I only saw Kino and Tim for maybe two weeks total out of every few years, if I was lucky enough to catch them in Miami. When I couldn’t make it to Miami, either because of scheduling conflicts or when I couldn’t afford to, I was all I had, and often it was hard to hear my teachers’ loving but firm voices, and the simplest advice “just keep doing the practice”. It was difficult to to remain motivated when I felt so alone with a practice that I truly loved, but hadn’t even begun to scratch the surface of yet. Every time I saw my teachers, I felt like i was performing the asanas, so that I could be a good student, but I didn’t always connect to the feeling of surrender that I now know it carries. But..then I went to Mysore for the first time and things began to shift a little. I remember listening in conference when a fellow student asked “what do you do when you don’t have a teacher in your town/city/country and you have to practice all alone?” Sharath was quiet for a moment, then he said “go buy a photo of me and put it up in your practice room and think of me saying “bad lady!”. Laughter all around. As the giggles subsided, he became more serious, more reflective. He said “I wish I could still have MY teacher with me” and we all fell silent as he shared how much he missed his grandfather and how much felt the responsibility of carrying on his legacy. He shared that sometimes when he was traveling, he would look up to see the full moon and that it felt like his grandfather was still there with him. The point is “when you truly surrender to your teacher, it doesn’t matter where you are”. Over subsequent trips to Mysore and having had the chance to assist Kino and Tim in teaching their two-week Ashtanga intensive, I began to see and feel this more and more. When Kino would say “you can do this, you have the strength and flexibility, just try” I really understood what she meant, I could release my fears and trust in her judgement, her experience and her understanding of me, because SHE said I could, I really could. There was tremendous empowerment in surrender. But I never so much believed in it until the day (March 25th) of my most recent trip to Mysore. I stood up from my third backbend to hear Sharath say “what you did?” “Laghu” I answered, faintly, my heart full of dread “Show me” and when I did, he said “Kapotasana, you do” before turning his attention elsewhere. There it was, my moment of truth with a posture I had lamented and cried and languished over for two whole years. And there, in that very moment, I surrendered and tried, and like a miracle, I managed to get my heels for the first time on my own. I was gobsmacked, and then when Sharath came to do my backbends, I was able to hold my ankles for the very first time. “So flexible” he smiled and walked away. I collapsed in the ladies’ room and laughed and sobbed as I never have before,or since. I had gone beyond understanding in that moment. I had learned what “connection” meant. After Sharath authorised me (he said to my shocked face, “now someone in your country can teach”), I came home to Jamaica to figure out how to start on the journey of sharing this amazing practice in its traditional form. Now I feel the other side of that connection. My students are a tiny, but dedicated group, and they trust me, with all my humanness and misgivings. From the first Surya Namaskara to the last “shanti”, they surrender in the same way that I did, and I’m humbled by it. Being a teacher now, I’m still trying to figure it all out. I’m far from being wise, and I get scared sometimes, but I believe in the method and every lesson I’ve learned. I figure as long as I continue to practice and share with compassion and honesty, then I honour Kino, Tim, Sharath, Guruji and every teacher that has gone before, and those of us who continue to try to give our best to our students, every single breath. Kira, and now that you’re authorized, how do you feel about being the only authorized teacher in the Caribbean? Is there a heavy sense of responsibility? Mercy, I’m terrified and excited and completely aware of what a huge responsibility it is! I had to look at it from a number of different perspectives to even get my head around what it all means. 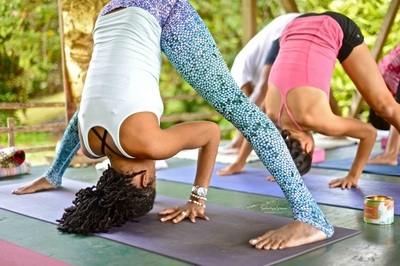 For one thing, yoga is becoming very popular in Jamaica, and across the anglophone Caribbean, but the idea of traditional early-morning daily Mysore-style Ashtanga can be very challenging for many students, you can see the looks in their eyes, when I say “Yes, ultimately, you show up every day and do your best”. It takes a while, but they begin to see that the practice must be more than a physical thing, that the focus and discipline and devotion needed to truly transform a few classes and poses into a real practice, a real part of their lives. It’s not a casual thing, and they’re beginning to see that. It’s my responsibility to hold that space for them, and to be a beacon of “it’s OK to be here, it’s going to be difficult, but it’s going to be worth it, because every that transforms you will be”. The other idea is that I want so much to share the practice in other parts of the Caribbean, where ideas about yoga are still quite varied. Last June, I was honoured to be selected to teach at the inaugural staging of the Downtown Nassau Yoga Festival on Providence Island in the Bahamas. We didn’t have the largest group, but the people who showed up were so excited about yoga, and they were full of questions about Ashtanga practice, Mysore and yoga being a part of a peaceful lifestyle, that I was just so grateful to be able to share and listen. 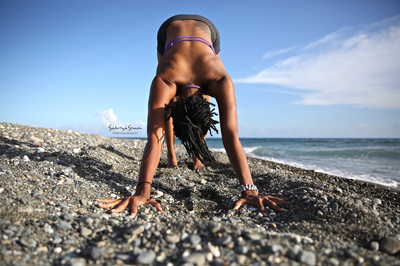 I think also that it is a powerful message when yoga (which isn’t endemic to Caribbean culture - which is so motley and dynamic in and of itself) takes root here, it speaks to how universal this practice is, regardless of ethnic background, skin tone, creed, religion, philosophy or living circumstances, we can, every one of us, find more peaceful and fulfilling lives through yoga. For my personal practice, I’m even more aware of how important daily practice is, and the commitment to that is staggering. Even through illness (I contracted the chikungunya virus in September, and have struggled with severe joint and muscle pains for months), even when I’m feeling weak or stiff in my body or exhausted from teaching, even when I don’t want to, I roll out my mat anyway, because I’m called to this practice, and in gratitude to my teachers and to every person (whether they practice Ashtanga or not) who believed that I could walk this path, especially on the days when I didn’t believe. Whom do you seek advice from when questions arise during your practice or teaching? Hooray for the Internet!! When I have questions, I write my teachers Kino and Tim, as busy as they are, they take time to respond if I’m not sure about something in my own practice, or how to help a student. There are also other fantastic Ashtangis that I’ve met in my travels to Mysore with whom I stay in touch and who give me day-to-day advice. Other than that, I’m on my own (which is scary at times) and I’m left to figure out some details by myself, whether it’s deepening to catch my ankles in Kapotasana, trying to get my left leg lower down my back in Eka Pada Sirsasana or how to help a student who’s frustrated by Marichasana C and is at the edge of tears. I don’t always have the answers, but I listen and learn and try my best every day. Kira, you practice most of the time alone so what tips would you give to home practitioners to keep the practice going when they are struggling with doubt? I’ve actually come to think that doubt is a natural part of the practice, as in any process that goes beyond the superficial plane of our human experience. I mean, at first, when we practise and everything is shiny and new, we feel immortal and awesome, right? And then a bit of almost a necessary boredom creeps in, as if “OK, I’ve done this, I understand this, NEXT!”. What we don’t know until long afterwards is that that is the furthest thing from the truth. When we seek to push ourselves, we find things that we cannot fully get our heads around, maybe not being able to find that deep twisting action in Parsvakonasana B and beginning to think “Wait, this isn’t as easy as I thought”, and then we worry, because we want the answers all at once, we want our bodies to fall instantly in stride with our minds. Doubt. And in that moment, is the shimmering opportunity to find a deeper understanding of ourselves. When things get hard, do we give up, or do we force our way through? Do we get angry and frustrated? It’s a chance to really get still and witness what is happening, and, simultaneously, a chance to make true breakthroughs, beyond the body. I say all that to say that I doubt myself all the time, when a posture feels too “easy” or when I cannot do something with ease and grace the very first time I try. Doubt gives me a chance to ask myself “Why am I doing this? By what forces am I being motivated?” So I stop, take a breath, and try to look at the posture or the experience surrounding the posture in a different way. Being alone most days, I don’t get to reach out in the moment to ask for another perspective on approaching the posture. If I want to practise with devotion and diligence, I must learn to trust myself and develop my instincts. I have to learn to balance how I feel with the principles of safe alignment, all within the paradigm of the vinyasa system. I want to keep to the breath, but I also want to deepen within a certain movement or sensation, to understand it and myself better. The trick, as always, is in finding that delicate balance. Do you have favorite yoga sutra(s) and why? There are so many! I’ll pick my three faves! Sutra 1.1 “Atha yoga anushasanam” - “Now begins the study of yoga” - I think, “how brilliant is this, the Sutras begin with the word “now” - now, this very moment. Not some time in the past that people can argue over or not relate themselves to, not next week or next year which we have no real clue of, but NOW...whenever YOU are ready, the practice is here for you, it won’t be easy, but you can make the journey and live the path, just begin it...now. I LOVE that. The yoga practice won’t be mad that you weren’t consistent every single day, it exhorts and encourages with a single, powerful word...now. Sutra 1.14 “Abhyasa vairagyabhyam tat nirodhah” - “Thought patterns are brought under control by practice and non-attachment. This one is HUGE, you know? HUGE! Particularly in this instant-satisfaction world we live in, we want things, experiences, feelings now, when we cannot find peace within our own selves, we search for it without, with others, with things we can even less control of, and then we’re devastated and angered and reeling when we don’t get what we want. Here is this practice saying “do your very best” - apply your best effort, bring your fullest attention to the task at hand, with breath, with focus, with form and healthy technique (you can apply this to anything, right?) and “don’t identify with the results” - meaning you are not your strongest arm balance nor are you your deepest backbend, the fact that your body can change to become stronger and lighter and more flexible, also means change can adversely affect you too. If you’re attached to how well your badly you perform asana (or any other action), how do you learn to deal with change? How will you ever know your true, deep, mind-self? How will you be able to progress in anything, if you paralyse yourself by judging yourself, evaluating your worth by what you could do [TODAY]. I think I struggle with that one most, with a body that no longer can do some of the things it could (also I can do other new things I couldn’t before, but do you notice the things we focus on to collect ‘evidence of failure’?- thanks again, Kino), and some days, it’s a genuine mental struggle to get on my mat, but I do it, I do my best. It looks different each day. And you know what? That’s fabulous. Sutra 1.33 maitri karuna mudita upekshanam sukha duhka punya apunya vishayanam bhavanatah chitta - In relationships, the mind becomes purified by cultivating feelings of friendliness towards those who are happy, compassion for those who are suffering, goodwill towards those who are virtuous, and indifference or neutrality towards those we perceive as wicked or evil (prasadanam) - it reminds me every day to be kind, but not an enabling or a co-dependent personality (I used to be, when I needed to please others before myself), to do no harm and to walk away from situations that create harm for me, and always to try to help others where I can, no matter our differences. Yoga completely changed my life, I will always be grateful for it, every breath between now and my last exhale.